Fair Islanders were almost totally dependent upon fish for their livelihood from before the 16th century until the early 1900’s. Since then there has been a dramatic decline in fish stocks around the Isle. 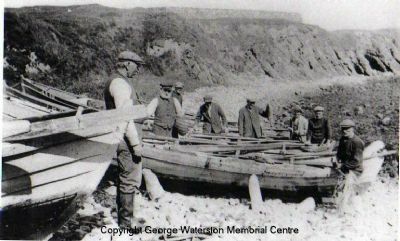 Over-fishing by increasingly larger, more efficient boats from elsewhere has meant that fishing is no longer an economically worthwhile activity for the islanders. Today all fishing is done by islanders for home consumption. The importance of Fair Isle's maritime and cultural heritage and history is strongly reflected in the local Fair Isle dialect and folklore, with a richness of words and phrases associated with the sea and Fair Isle's traditional fishing activities. 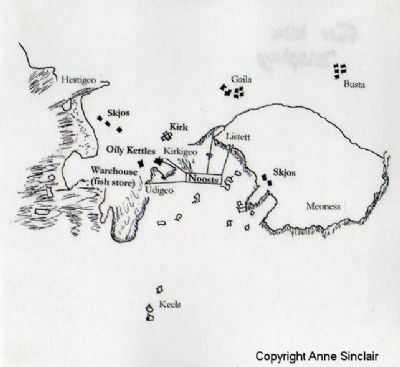 A map of the South Harbour shows the fish processing activity of the early 1800’s. Skjos were small huts, built of stone, specifically for drying fish. The resulting product was known as ‘skjo blawn’. A new warehouse was built in 1807. 15-20 yoals were putting to sea when weather permitted, and the resulting catches were mostly transported to Orkney. Fair Isle, over the centuries, has exported falcons, feathers, kelp and knitted goods, but its mainstay was always fish oil and dried fish. The fishing station situated around the South Harbour was the centre of activity with the huge iron pots for heating the fish livers to extract the oil, the noosts where the boats were kept, and the drying area and storage facilities. Looking north from the drying beach we can see the Warehouse, the ‘Oily Kettles’ and the Kirk, with the newer Lighthouse store in the centre of the picture and the Haa and the tiny ‘tun’ (town or homestead) of Gaila to the right. Fish, salted and dried on the beach, is stacked up for export. The ‘beach boys’ were responsible for drying the fish and for beach cleaning. 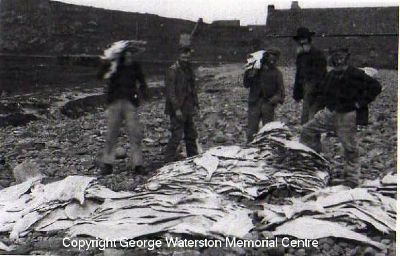 The dried fish, always the property of the laird was, after 1866, sent to Sumburgh. Some fish liver oil was still being produced in the Isle and was used for greasing items such as the axels of ox-carts. 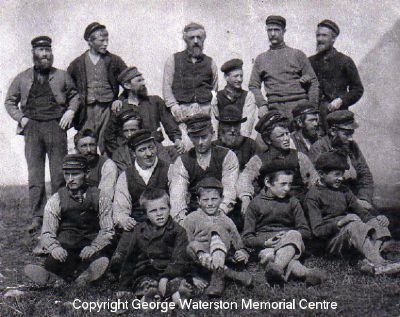 A group of fishermen and beach boys photographed before the turn of the 19th century. A time of change was fast approaching—best illustrated by the fates of the 4 boys in front. Jerry Wilson—Brews—Killed in the 1914-1918 War. James Wilson—Haa—remained on Fair Isle. William Eunson—Stackhoull—settled in Kitchener, Ontario. Alexander Eunson—Stackhoull—died of exposure, age 14, in the Fair Isle Disaster of 1897. 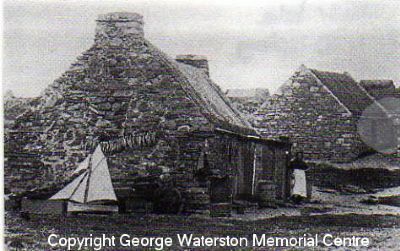 Nellie Wilson of Haa making the most of a spell of good weather to dry fish for home consumption on the south gable of the house, to do a little spring cleaning, and to air the sails of a model boat. Biodiversity and the use of sustainable resources—the ideal in action. Sea birds and their eggs were an important source of nutrition and were ‘harvested’ with care to maintain the ecological balance. Over the centuries many of the inhabitants of Fair Isle have been aware of the significance of their natural heritage and its fragility. 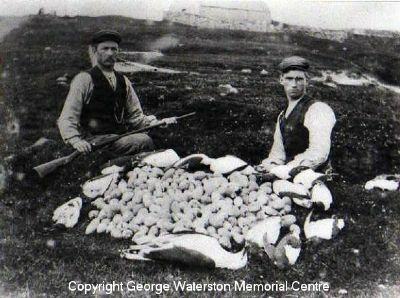 This photograph was taken c1900 and shows Jerome Wilson of Springfield and Andrew Wilson of Shirva with a valuable addition to the diet of several households. 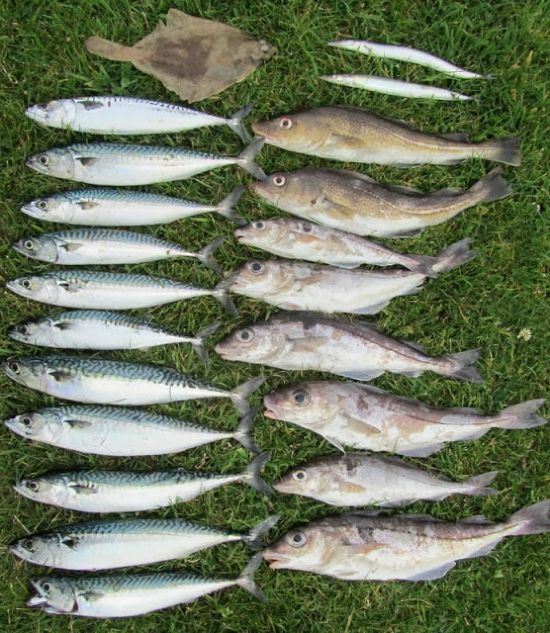 Sometime during the eight years or so after 1905, fishing on the Isle changed from the use of handline for catching saithe and some ling and cod, mainly at ‘de Rőst’ up to three miles away, to catching haddock and whiting, using a long-line, from the ‘banks’ - Midsaithen, de Grund and Keelin Grund—about a mile off shore. It is difficult to determine the reasons but it is likely that saithe had become rare in the waters directly around Fair Isle, possibly due to a change in the physical conditions of this body of water, causing the saithe to move further offshore, and/or because of over-fishing by trawlers steaming up from south to utilise the extensive fish resource around Fair Isle. The fishing hands of Fair Isle have developed over the centuries, and continue to do so, as a means for the fishermen to re-find particularly good fishing areas. They consist of a phrase usually indicating an alignment of two sets of landmarks, taking the boat to the exact position required, time and time again. The landmarks must be visible in various sea and weather conditions, and include rocks, cliffs and man-made features. From Fair Isle the ‘grunds’ are generally from one to three miles. 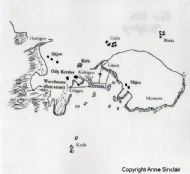 There are several main fishing grounds around the Isle, within which some of the fishing hands lie, for example: Midsaithen, de Grund, de Rőst, Hoolmin and Keelin Grund. The first yoal to arrive at a ‘grund’ would use the most reliable hand. 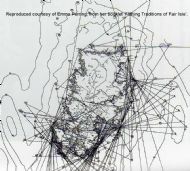 A map of Fair Isle Fishing Hands was produced largely with the help of Jerry Eunson , Jnr., (originally of Houll, Fair Isle) writing down the fishing hands remembered by the fishermen of the Isle in the early 1960’s. These were printed in 1961 as The Fair Isle Fishing Marks, Scottish Studies Vol 5 (pp 181-198), Loiver & Boyd Ltd., Edinburgh. As part of the Fair isle Marine Environment and Tourism Initiative, these hands have been enlarged upon, adapted and mapped with the help of the fishermen of Fair Isle in 1999, in particular Stewart Thomson of Quoy, George Stout of Barkland and Brian Wilson of Houll. 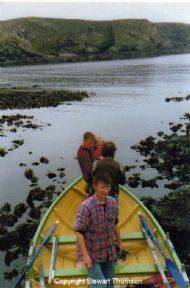 This photograph shows Fair Isle men returning from a trip to sea. The yoal remained the model of boat used, but use of sail became rare. Tubs of lines with 3-400 hooks were set at the right time of tide and hauled immediately. It was not infrequent for every hook to be holding a fish. Three or four yoals worked every day, sometimes twice a day, during the summer months—weather and landwork permitting. These fish provided the islanders with their main source of protein year around. They were eaten fresh through the summer and salted, split and dried for winter use. 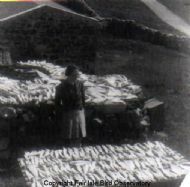 This photograph shows fish laid up to dry at Upper Leogh. Some salt fish was sold or traded for goods with grocery shops in Orkney and Shetland. Occasionally baskets of fresh fish were taken to market in Aberdeen or Shetland by friendly masters of fishing trawlers, and sold on behalf of the islanders. halibut in 1959—by then becoming a rare sight. By the 1970’s white fish had been fished out by the seine netters of the 1960’s, lamb production on the Isle increased and freezers arrived, thus a winter’s supply of salt fish was no longer essential or feasible. 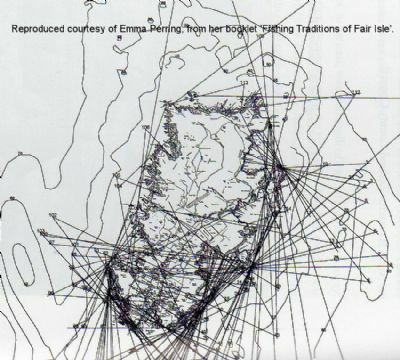 Shellfish boats from elsewhere started setting hundreds of creels at a time, threatening a traditional, carefully managed island activity carried out sustainably - and the part-time income that went with it. Now going ‘aff’ is seen by most as purely recreational, but with the hope of bringing home a welcome addition to the diet—ling, Pollock, mackerel or piltock. Some islanders still salt fish, while others smoke it. Even if we no longer fish for our livelihood, the marine environment remains of the utmost cultural importance — after all, we live right in the middle of it! 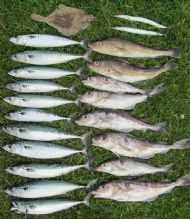 This small catch of fish was all that was caught by a Fair Isle boat on a fishing trip around the Isle in 2012. Just enough for the fishermen's family to have for tea. In great contrast to the large catches of fish years ago when one small Fair Isle yoal could catch enough fish to also supply themselves, their extended family and neighbours for a meal or for salting, drying or (nowadays) freezing for over the winter. "At the end of the nineteenth century, the crofter-fishermen of Fair Isle were able to row out to sea less than a kilometre and catch a yoal full of fish in half an hour. 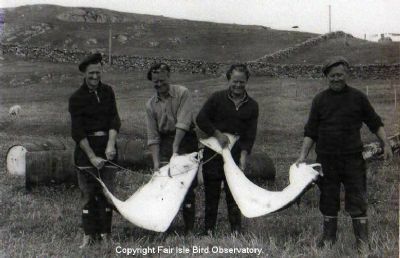 The waters surrounding Fair Isle were teeming with fish, and it was primarily this resource that supported the men and their families: through export and for home consumption. Yet today no islander is employed at the fishing." 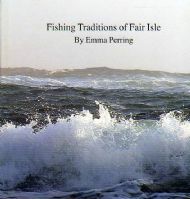 Based on Fair Isle diaries this booklet explores the changes in fishing stocks around the isle during the 20th century and what impact this has had on the community. 32 pp. Illustrated with a mixture of colour, black & white photo's and line drawings. Price: £5.80 each plus P&P. For more details please use CONTACT FORM on this website. For more details please use the CONTACT form on this website. Fair Isle, from the first - a Viking longship in AD. 900, to the last – a scallop vessel from Buckie in Scotland on her way to Shetland - in 2001. Also included are the Spanish Armada flagship El Gran Griffon (1588), the Lessing (1868) and the Fair Isle Disaster (1897). 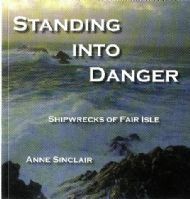 Where known, details are given of the ships’ cargoes, number of crew and passengers on-board as well as some very poignant descriptions of dangerous and heroic rescues in hazardous seas by the local men of Fair Isle using their small Fair Isle yoals and of the difficulties of providing food and accommodation on the Isle for so many rescued souls. Price £7.95 plus P&P per copy. 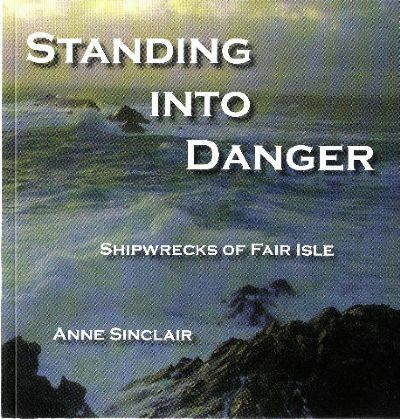 Text Copyright Fair Isle Marine Environment and Tourism Initiative. Photographs Copyright as indicated. All rights reserved.